While the Wii Sports Resort bundle costs more than most other Wii games, it comes with more important stuff than the rest. The bundle comes with the game and two Wii Motion Plus adapters. Wii Motion Plus is one of the biggest improvement in the history of video game controllers, and is necessary for playing Wii Sports Resort. Let’s take a look at what makes this Wii bundle so special so you can understand what you are really paying for. 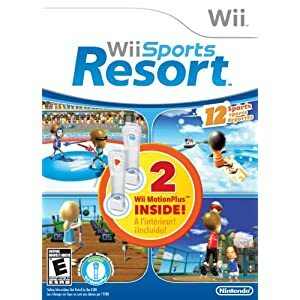 The game included in the bundle, Wii Sports Resort, is the sequel to Wii Sports, the game that is bundled with most Nintendo Wii systems. Resort is much more developed than its predecessor, and is a full game, rather than a small collection of different sports. There are twelve different games inside the Resort, which include swordplay, wakeboarding, frisbee, basketball, archery, ping pong, golf, bowling (different than the first game), canoeing, flying, cycling, and jet skiing. Each game has multiplayer versions that allow your entire family to get in on the action. The games are easy enough for video game novices to pick them up and have a great time, and advance enough to challenge veteran players. Accessories are also available for most of the games, like a ping pong paddle that connects to the WiiMote to make game play even more realistic. What really sets this bundle apart from Wii Sports, as well as most other games, is the inclusion of Wii Motion Plus. Originally, the WiiMote was able of roughly tracking the controller’s movements. It was great at following back and forth motions, but struggled with rotation and backward/forward movement. The Wii Motion Plus is a small add-on that plugs into the bottom of the controller (where the Nun Chuck normally does). It adds the ability to finely track all movements of the controller, which makes major improvements in its ability and your game play. All Wii Motion Plus additions come with a longer skin to cover the entire controller. On their own, the Wii Motion Plus costs about twenty bucks. With this Wii bundle you get the great game, two Motion Plus additions, and the skins to cover the entire controller for about $75. When you factor in that Wii games generally cost $49.99, this is a big savings! The Wii Sports Resort bundle make a huge improvement in the ability of your Wii, and includes a fantastic game. Keep your system up to date and provide your family with hours of fun with this awesome bundle!